No one ever thinks about the ghouls. The henchmen of the pulseless, ghouls do all the work but get none of the good press that vampires enjoy. Even zombies have better PR than they do, and all they do is eat, groan, stumble and decay. In this new found age of acceptance for horror, the ghouls are still hiding in the shadows, waiting for their moment. RJ Barker and Mikko Sovijarvi have decided that needs to change. Instead of dragging them out into the light though, Barker and Sovijarvi have done something much cleverer. Social Diary of a Ghoul follows a week in the life of a ghoul family, but makes no attempt to put them in any artificial context outside the slightly English banality of marking the time in a week. The result is unlike any other piece of horror fiction you’ll read this year. First off, there’s Barker’s tremendous love for language. It shines through on every page here and is reminiscent of the classic Alan Moore-scripted run on Swamp Thing. There’s the same love as text as texture here, with prose you feel like you could sink your hands into. It’s used as connective tissue between the reader and the ghouls too, evoking their loamy, quiet existence without ever becoming overblown or purple. Instead, Barker takes the reader on a complete circle, starting with horror, going out through twisted but charming and back to horror at the end of the week. We get a sense of the characters of the ghouls, of their dynamics as a family and how they view humans. We like them and then Barker shows us just what we’ve begun to sympathise with. It’s subtle, elegant writing all the way through, funny and well observed, tragic and comedic by turns. Sovijarvi’s artwork closes the circuit perfectly. It’s white on black, the text wrapping and warping like coffins left in shifting Earth. All around the words, Sovijarvi’s art grows and twines like something organic. It’s beautiful work, mixing photography and illustration in a way which combines detail and life, with the inevitable decay and death that go hand in hand with the ghouls. Like the text its rich, detail heavy stuff and, like the text, it illuminates every aspect of the characters. Together, the two create a book where text, structure and layout are all lenses to explore character with. All ways of peering into the Earth and looking at the quiet, complex lives of the terrible yet sympathetic creatures that live beneath us and, in the end, on us. 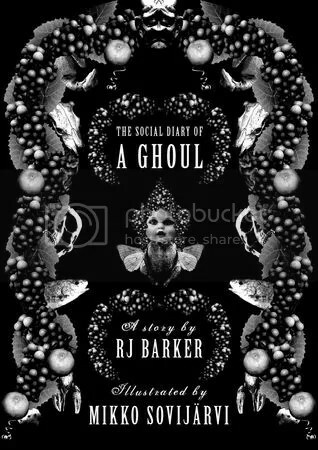 Social Diary of a Ghoul is a very quick read but it’s one that will stay with you. This is subtle, clever, unblinking horror and if you’re even a little interested in genre fiction, you absolutely need to read this. Here’s the Amazon link. As of December 13th, the book is a free Kindle download.